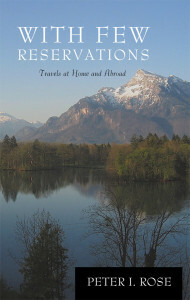 With Few Reservations is a collection of 48 engaging commentaries that includes lively takes on what a travel writer does (“Eats, Shoots, and Leaves”) and vivid descriptions of what it is like to enjoy Austrian ambiance of in the Green Mountains of Vermont, Italian culture in a Swiss canton, the awesome scenery in Patagonia—in short, all of the delights and foibles of travel. Author Peter Rose tells of his own conversion experience in the Arizona desert, playing a gumshoe in Honolulu, serving as a tour guide in Amsterdam, visiting Sarajevo, traveling across Europe by river boat, windjamming off the coast of Maine and in the Mediterranean, and savoring the unique flavor of other special places and experiences from Cape Cod to Cape Horn. He steps inside the travel business and offers a view from behind the scenes. Several photo essays vividly bring to life the places he describes and the fascinating people he met in his travels. For may years, Peter I. Rose lived two lives, one as a highly regarded teacher and research of sociology and anthropology, the other as a writer, editor and observer of travelers and their destinations. Seven years ago, Rose stepped down from his full-time academic responsibilities, although he continues to teach and do research on a part-time basis. But seemingly, he is still a robust traveler whose prolific output of travel essays continues to reflect his passion and enthusiasm for never ending excursions, both at home and abroad…. Rose’s writing style in “With Few Reservations” mimics that of a sophisticated conversationalist, whose warm and charming manner would make one feel fortunate to have been seated next to him on a plane or at a dinner party. The eclectic mix of destination reviwes and essays, reflections on travel writing and his life observations comprise nearly fifty stories….They are segmented into four groupings: American Potpourri; In Foreign Climes; Dreamers Holidays; and, Revelations. The last two collections, “Dreamers Holidays” and “Revelations,” contain the essays that resonated with me most…. 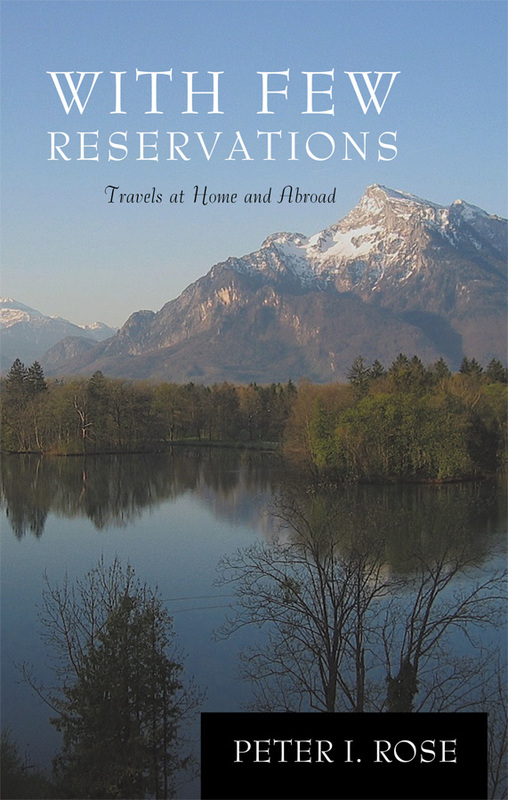 “With Few Reservations: Travels at Home and Abroad” is a well-written, engaging, and stimulating collection of commentary. Peter Rose has a highly developed ability to pain word pictures that draw the read into his writing and see vividly in their mind what he is describing. Although the book’s black and white photos, with few exceptions, are a half-page or smaller, they are appealing and effective. For both dreams and avid travelers, this book will provide an exceptional reading adventure. Peter Rose, a retired Smith College professor of sociology, adds an academic’s penchant for insight and analysis to his innate curiosity as a writer who has traveled to many parts of this country and to many countries abroad. In these pieces, some previously published in the web magazine, SoGoNow.com, The New York Times, the Christian Science Monitor, Vermont Magazine, and Hampshire Life, among others, Rose writes about a wide range of experiences, from searching for shells on Sanibel Island in Florida, to cruising on a luxury line as it passed through the locks of the Panama Canal, to hiking in Patagonia, to walking through malls in suburban America, to discovering tiny, rural villages in Italy, to observing the appearance and behavior of American tourists in China. Closer to home, Rose offers up his take on Cape Cod’s amenities– and its social stratification that defines its complete mix of Brahmins, locals, outsiders, summer people, renters and temporary workers, among others.